Like most people I know, I have just a very narrow sphere of knowledge that I’m willing to let penetrate my consciousness at any given time. There’s so much I know but don’t want to know. So much I choose not to acknowledge. It’s a form of self-preservation, because if I were to allow myself to really feel the unnecessary pain and suffering that floods our world like an endless terrorized scream into the night wind, all the time…I could not bear it. I would go insane. 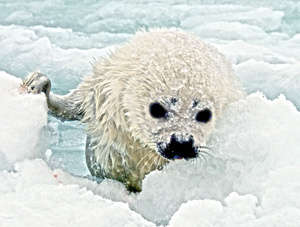 What prompts these reflections today is the news that hundreds of thousands of seal pups are drowning in the Gulf of St. Lawrence this season, after a straight run of disastrously warm winters where the pack ice on which harp seal moms give birth has been too thin to provide the shelter the pups need to survive. 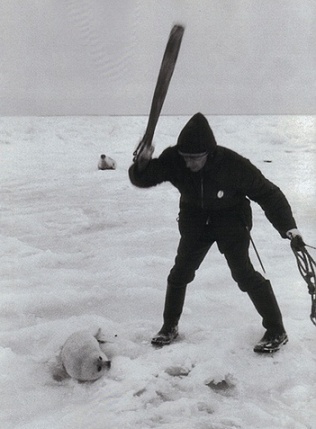 Add to this the fact that the Canadian government, knowing full well that the harp seal populations are in dramatic decline due to global heating, is still going ahead with the annual seal pup hunt, allowing as many as 330,000 pups to be clubbed to death by hunters this season. 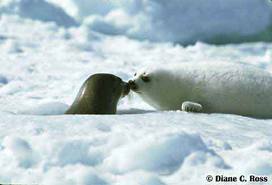 This despite the fact that Russia and the European Union, the principal clientele for seal fur, have banned imports this year. Despite the fact, too, that a huge backlog of seal pelts is sitting in warehouses. It’s one thing to kill animals for food. Human beings are carnivores, after all. But killing for sport…killing for unnecessary furs…killing for no good reason makes me feel deeply ashamed of my species, and heartsick for the loss of life. I don’t know what to do with these feelings. Signing yet another online petition or sending yet another contribution to a Save the Seals campaign does not seem anywhere near adequate. I am not capable of practicing tonglen, taking in the suffering and sending out lovingkindness to both the victims and the perpetrators, as Buddhists like Pema Chodrun recommend. I can neither bear to take in the suffering, nor stomach sending anything akin to kindness to the perpetrators. So I do what most people do. I close my eyes. I grow some kind of hard shell around my heart. I choose, without even consciously realizing what I’m doing, to ignore news and information that will upset me. I remember clearly that as a child, I was not yet capable of this degree of callousness. I very rarely was exposed to any suffering, since I grew up in a very sheltered environment, but every so often something would manage to get through into my sweetly padded cocoon, and leave me gasping in empathetic pain. Once I was standing outside on the lawn in front of the house, and a bird whizzed by me and flew straight into a window. It fell to the ground, stunned. I ran to it and picked it up, cradling its trembling body in my arms. Its neck was probably broken…it died within an hour. I held it and cried over it and mourned it so deeply that even now, so many years later, I still tear up thinking about the sorrow that small death called up in me. I can’t live with that kind of sorrow all the time; I would be paralyzed with grief. And so I compartmentalize. 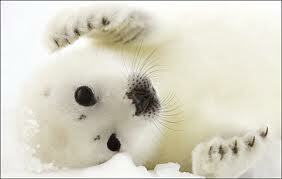 I go about my business and actively avoid thinking about the thousands of seal pups dying today. Or the wolf pups being poisoned by the Canadian government to clear out the boreal forest in preparation to extract oil. Or the millions of songbirds and waterfowl killed each year by US federal government agencies because they get in the way of industrial agriculture or airplanes or golf courses. Just for a moment, let’s dare to imagine what the world could be like if adults like me did not deliberately silence and smother our empathy for the creatures who need our help to survive. Love might just be the most radical gift we could bring to the world. What could be more potent than action fueled by love? Do we dare? Can we afford not to? I used to believe that we are carnivores. We’re omnivores. Unlike cats that need taurine, we can live a long and healthy life without meat. Our “need” to eat meat is just one more money-spinning bit of scam propaganda. Many of the top athletes of the world and many, many other people live as vegans and vegetarians. All our nutritional requirements can be readily substituted. The death of the seal pups is a disgrace. BUT the every-single-moment-of-their-life misery and suffering of factory animals is our absolute shame. When we eat meat we are filling our bodies with growth hormones, antibiotics, massive amounts of planetary resources and unspeakable cruelty. I gave up meat two years ago because to eat it is to actively participate in the horror. Many people believe that a time will come when we look back at meat eating as we now do slavery, child-labour, women’s oppression and so on; a long and shameful period of our social evolution. It’s simple really. Watch the abattoir footage and then decide. Thanks for your blog. I love that you are reaching people with your well-researched and enlightening posts. I don’t eat meat anymore; other than some chicken. I will write about factory farms too. It’s one of those things I can’t bear to think about. But I will. The least I can do is be strong enough to give these issues my loving attention…. You know, you’ve become really important to me. I don’t want to carp on about it, but my family and community went through a ghastly climate change wildfire three years ago. A docco on telly last night interviewed my youngest daughter. We are affected at a profound level, and I am sick at heart for the future. Your blog is one that offers comfort in a world gone mad. So thanks. Angie, I have so appreciated all your comments too! I hope we will get to meet in person one day, but in the meantime, let’s keep giving each other moral support. We need it, as you say, in a world gone mad….. I am a vegetarian. What puzzles me is that a lot of people view this as a threat of some kind as if we are subversive, it makes me laugh. We don’t eat animals because we are extra sensitive and yet we are treated as if we are weird. How can a decent person, many of whom claim to be animal lovers, support the awful meat industry. Heh. Let me attempt an answer, Sukie. I respect vegetarian choice. But why do you have to attack the rest of us self righteously by saying that we support the awful meat industry? When you stoop to attack, I figure… eh, another self-promoting fanatic, looking down their nose at everybody who does not cleave to their way of doing things. We should all be on the same page, in our opposition to the meatrix, no?